When you get stuck in a rut and start to adopt an unhealthy way of living, it can be very easy to stay with these bad habits for a long time. If you want to live a long and happy life, then you need to start reassessing your lifestyle choices sooner rather than later. Preparing your body for health and happiness in old age doesn’t have to be hard work; you simply need to change your outlook on life and value your incredible body much more. Whether you’re trying to quit smoking or you need to reconsider your hectic schedule, there are a number of ways to embrace a healthier way of life. Take some inspiration from here and start kicking bad habits to the curb! When you have been a smoker for a long time, it can be very easy to stick with what you know. You may not be aware of the adverse health conditions you are causing for yourself, so it’s time to start thinking about the long term. Not only are you exposing yourself to lung cancers, but you will also be susceptible to aging skin, yellow teeth, and discolored fingernails. You might want to consider a lost vape Orion kit, so you can quit your bad habit more easily. Take up another hobby such as walking, reading or cooking so that your mind is occupied and you’re not thinking about picking up that cigarette. If you’re a couch potato who tends to laze around every evening rather than getting up and about, then you need to rethink your exercise regimes. If you increase your daily exercise then you will be working wonders on your health for the long run. Partaking in around thirty to forty minutes of physical activity each day will reduce your risk of heart disease significantly. You will also decrease your chances of becoming obese or overweight if you get your body moving on a regular basis. You might have a bad habit of overloading your schedule so much that you never have time to think or be alone. Nowadays it is quite trendy to be busy and on the go all the time, but you need to consider the long-term effects. Filling your schedule with social appointments, work meetings, and gym classes might just take its toll on your mental health over time. Give yourself at least one day a week where you can relax and take some much needed time out for yourself. You will start to realize why it’s important once you start doing it on a regular basis. You never know how important sleep is until you’re really missing out on it. When you are getting a low level of deep sleep each evening you aren’t allowing your body to repair and recover. Sleep is so important for your physical and mental health, so stop putting it on the back burner and get some much-needed shut-eye. 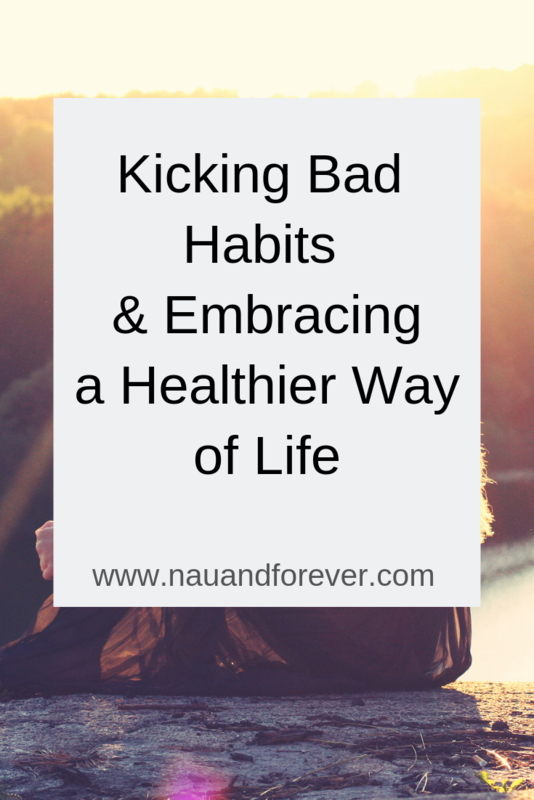 Kicking bad habits NOW will help you live a healthier and happier life. It’s not always easy, but it will be worth it. If you want more tips on healthy living, check out this post! How Animals Have a Positive Impact on Your Health & Wellbeing!